Ideal for Yellowfin, Bluefin and Big Eye, this sub-surface set is a combination of 4 of the most productive chains you can have in your spread. Two Laceration Plug Chains and Two Gooney Bird Sub Chains, pulled from a Flat-line or Long Rigger position, will give you consistent and productive results. 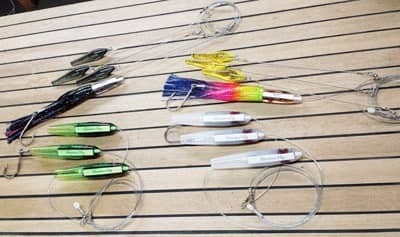 Each Plug Stinger and a Tuna Snack Stinger are rigged with 300lb Momoi Mono - the Plug Chain with a Quick Rig Big Game Style hook, and the Gooney Chain with a Mustad 7691. Sold individually, this set would retail for $439.80. We're offering them as a combo for $369.95 in a custom lure bag. Save $69.85 and keep in mind this product qualifies for free ground shipping to the lower 48.